The creator of the graphic novel Young Frances answers eight questions from eight fellow authors. 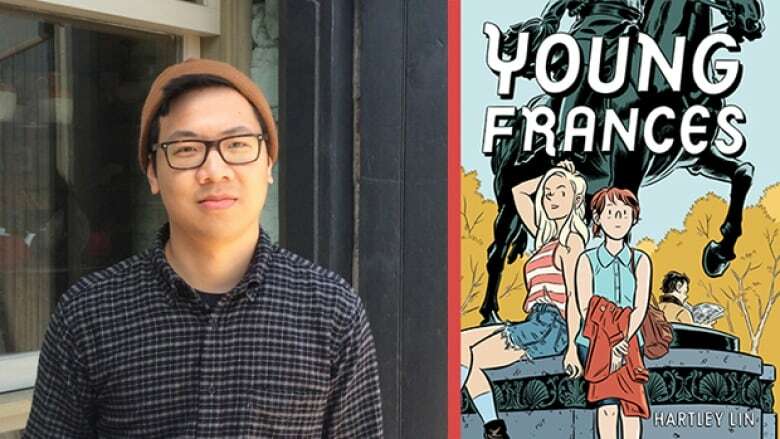 Montreal-based comic creator Hartley Lin has been steadily building a fan base since debuting his award-winning series Pope Hats in 2009. His latest, Young Frances, is his first longer form graphic novel. Funny, poignant and beautiful, the book follows millennial Frances Scarland's hesitant climb up the corporate ladder. Below, Hartley Lin, who is a featured guest at the Toronto Comic Arts Festival, takes the CBC Books Magic 8 Q&A. and answers eight questions from eight fellow authors. 1. Jillian Tamaki asks, "What do you wish was different about your workspace and how do you adapt?" My workspace set up is not impressive. Everything should be different. But for some reason I equate most upgrades, especially digital ones, with more headaches. I could use more plants. 2. Tom Gauld asks, "Have you ever looked back on a finished story and felt that an element of it was actually better in a previous draft?" Yup. But you kind of have to trust your instincts as you make hundreds of micro-decisions on the page. A couple times I've found myself revising and revising the dialogue for a "problem scene" until I finally realize that it circled back to the original wording. It's a waste of time, but I take it as a good sign. 3. Rajiv Surendra asks, "Is there a book that you wish you had never read? Explain. Please. Thanks." Hm. I once read a Kazuo Ishiguro short story collection that I thought was lazy and dull, which is the exact opposite of how I feel about his novels, and him as a writer. It wasn't the end of the world, though. 4. Adeena Karsick asks, "What recurring themes, tropes or obsessions appear through all your books?" This seems dangerous to answer… I guess my stories usually contain a lot of quiet despair and existential dread. Fun stuff like that. 5. Marissa Stapley asks, "If you had a crush on someone you saw on your morning commute, what book would you read on the subway to try to impress them/show them your soul?" 6. Melanie Mah asks, "What are your daily rituals other than writing?" I drink coffee. I tell my dog how much I like her. 7. S.K. Ali asks, "What surprised you the most after getting published?" Honestly? That people could react to this odd, introspective stuff that I created in a relative vacuum as if it were the most natural thing in the world. There was a lot of, "When do we get more?" 8. Yann Martel asks, "What's the favourite sentence (or scene) that you've written?" Once you've parted ways, people just keep breathing and growing and following a bending line that you can never quite clearly imagine. What makes Doug Wright Award-nominated cartoonist GG cry?